::Download Scientific Description:: ::Project Researchers and Highly Qualified Personnel:: ::Project Scientific Progress:: Both organic and inorganic solar cells create useable electricity according to the same general processes: i) light is absorbed in the solar cell material, ii) the energy from the light is used to elevate an electron within the absorbing material to a higher energy state, iii) the high energy electron is transported to another part of the absorber before it can fall back down to a lower energy state and iv) it is removed from the cell entirely such that it can travel through and give up its energy to an external circuit. Organic solar cells are typically composed of two materials, a donor material and an acceptor material. Light is absorbed in the donor material causing an electron to elevate to a higher energy state called the LUMO level. If it is left in the donor material then the electron will quickly fall back down to the lower energy level. It therefore needs to be transported to the acceptor material where it can stay in the higher energy level. Furthermore, in organic materials, the excited electrons may stay attracted to their former low energy state forming a bound pair called an “exciton.” This is a problem for organic solar cells because the electron needs to be free to migrate to the acceptor material where it can be transported out of the circuit and then give away the energy it absorbed. Luckily, the dissociation of the exciton tends to happen naturally due to an “energy gradient” that exists at the acceptor and donor material interface in much the same way a ball will naturally tend to roll down a hill because of the physical gradient of the hill’s slope. In this analogy, the interface causes the electron to “roll” from the donor material to the acceptor material. Once in the acceptor material, an electron can be transported to an external circuit. 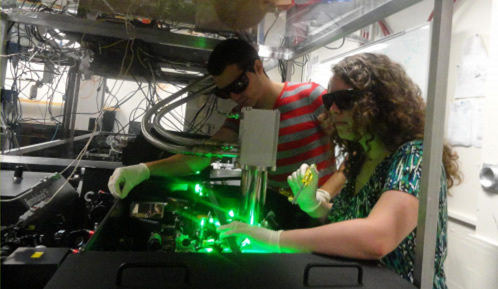 Figure: Françoise Provencher and Francis Paquin aligning a femto-second laser as part of Project 1 at the Université de Montréal. 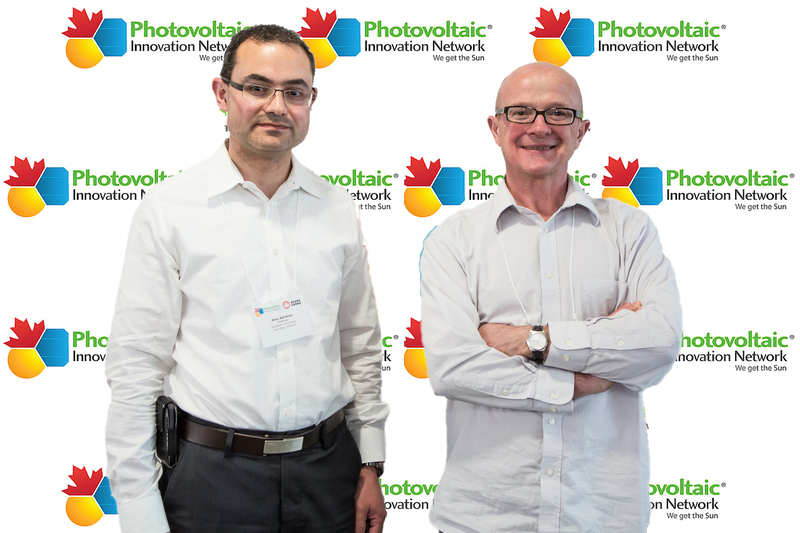 There are several challenges for researchers in organic PV, including: i) designing absorber layer materials and controlling their organization to optimize harvesting of light, ii) transferring that energy to the donor/absorber interface, iii) irreversibly dissociating the exciton, and then iv) forming a mobile in the absorber that can be transported outside the solar cell with a high yield. Our team will address the exciton dissociation processes at the donor/absorber interfaces by focusing on mixed-junctions of polymer-based donor materials with carbon nanotubes. Our motivation to focus on this particular material system is two-fold. Carbon nanotubes are not only promising electron transporting materials but also they are well defined structurally. This means that the geometry of the polymer/nanotube interface will be restricted to certain orientations, making it more straightforward to determine some of the interesting physics that happens during exciton dissociation. To conclude, we will explore various polymer/nanotube systems with the global objective of unravelling the physics that dictates interactions across nanoscale interfaces in organic PV, with particular interest on the exciton dissociation processes.